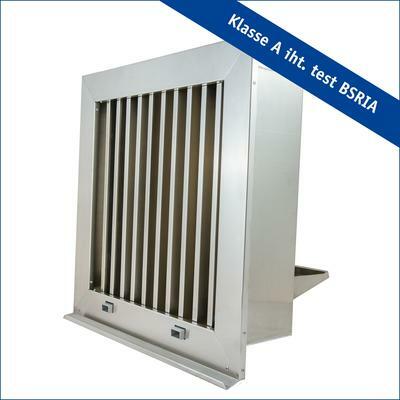 VSR is designed for use as an air inlet unit in areas exposed to adverse weather conditions. Can be installed in external wall or roof unit. VSR is equipped with vertical blades. The drainage chamber features external drainage, but is available with internal drainage if required. VSR is delivered with the flange unattached. VSR is delivered with welded lugs as shown in fig. 2. The flange, as shown in fig. 3, is attached to the unit by means of screws. It is important not to use the flange as a mounting frame. Sealing between wall and top edge is recommended in order to prevent rainwater along the facade from penetrating the grille.